The WMAS was proud to recognize one of our local stores. On this night we presented our first Gold Star award to a local store. Club PR rep Shane Heil came forward to present the award to Aquatic Dreams. Aquatic Dreams, and their owner Ryan Vickers, were presented this award for their continued support of the hobby and the club. Aquatic Dreams has donated over $2,000 worth of donations to the club, offered discounts to club members, advertised club events, and has frequently sent their customers to the club for help and advice. We had some awesome raffle items!!!! Thanks to Coral Reef Oasis, Reef Kingdom, Connie Perkins for their amazing donations. Upcoming events include the Marine Aquarium Expo this weekend. HUGE LOCAL STORE POKER TOUR coming up in 3 weeks. Geological History of Coral Reefs in May. We were pleased to have Frank Burr from the Coral Reef Oasis joining our club. 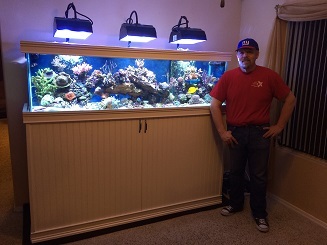 Frank has over 25 years experience in keeping marine aquaria. He owns and operates a coral farm as well as a retail store. 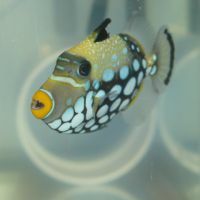 Frank is known for having the creme of the crop when it comes to rare/exotic/beautiful corals. 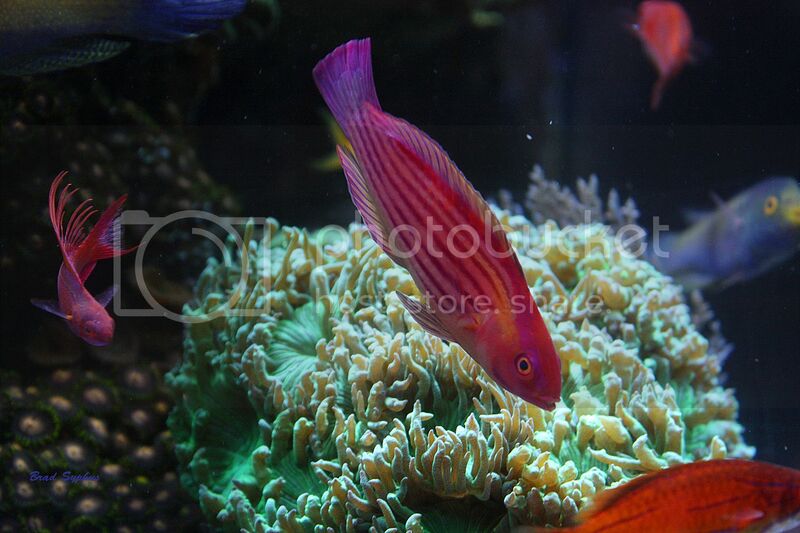 He specializes in growing limited edition corals for the hobby market. But the best at first- don't buy a small skimmer with the idea of buying a better skimmer down the road. Just make one purchase and save yourself the hassle and extra money by not buying twice. Lighting- while not clear cut, Frank states that he's seen much better growth and color from metal halides. They are still the preferred lighting system in the hobby. No water changes- don't do it. Or only do a little bit here and there. Just let it be stable and don't change water in your tank! Filter socks- work great, but you must change them every single day. He even recommends using them for only a few hours at a time when cleaning. Don't let them sit in there for multiple days. Test it- before you add anything to your tank, test for it! Don't add buffer without testing your alkalinity. Don't add magnesium without testing first. Always test, then add. Don't change it- don't add new pumps, don't change skimmers, don't add new lights. All of these things make the system unbalanced and can stun the corals. Just get it set where you want it, and keep it right there. If it ain't fixed- again if your tank looks great, don't do anything to it! Don't try out the newest gadget. Don't add a new powerhead. Don't try out a new skimmer. If it is working well leave it alone. If you really have to tinker and play... set up another tank. Thanks again to everyone who came to the meeting. And a special Thank You to Frank Burr. YEA!!!! I guess i am not a total idiot for doing this. Glad someone else shares my opinion on this. Great presentation as well. I am glad the Club could book him. I'll be there for the May meeting, though! What did Frank recommend instead of WCs? Trace element - type dosing? And did he say never do WCs - or "stretch them out", meaining like once every 6 months change a little instead of doing them once a month or more..? Just curious - I knew I missed out! Did anyone else notice that Frank said to test for potassium? I've never worried about it. How do you test for it? It was a great presentation, thanks Frank for the awesome frags too! BobC63: he said he only does them when he takes water out for fragging. I do the same, If I give a gal or 2 to someone I will have to add new SW but that is it. Some of the info on water changes flies in the face of what Anthony Calfo told us. I think that water changes are just fine, and I don't agree that he said to not do them. What I heard was an opinion to do smaller, more frequent water changes, which is what I subscribe to, if possible. I am with frank, i don't do water changes, just top off. And he talked about water changes with some types of tanks, but he hasmany of his personal tanks that he never does water changes to. Was Carbon or Phosban used on his systems or recomended? and What product did he say he used to dip all incoming corals? I'm pretty sure he uses carbon and the coral dip is Tropic Marin Pro coral cure. I think either ZeoVit or Elos makes Potassium test kits. ZeoVit users watch potassium almost as much as calcium and alkalinity. Carbon once a month if I rember right. And no other media. He said if ur system is stable u don't need other media other then carbon. Yes, Corey, you are correct. I didn't say (or mean to imply) no water changes. That is something I have experimented with sucessfully for my Self Sustaing systems. In a SPS system water changes are necessary but do make them smaller and more often. "Person with large reef tank.....have small wallet"
And yes, I use Tropic Marin Pro Coral Cure as a dip for all corals, just vary the exposure time depending on the type of coral. Frank, Which spectrapure ro/di unit would you recommend for a 300 gallon system, full of fish and sps? But you also use O3, correct? I always thought that carbon was a 24/7 thing with O3? Right now I run fresh carbon every 5 days in a phosban reactor...do I not need to do that?